White houses built into the staggering Ronda and Grazalema Mountains. Golden beaches soaking up the sunshine. 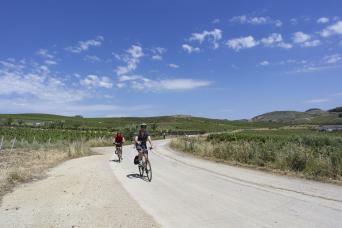 Whether going to Andalusia for its mountains, its food, or its beaches, Pure Adventures promises that this eight-day bicycle vacation through southern Spain will be one to remember. On a self-guided tour through the provinces of Malaga and Cadiz, the holiday biker will pedal themselves through a dreamy, rustic scenery that looks like it could have been pulled from a storybook. 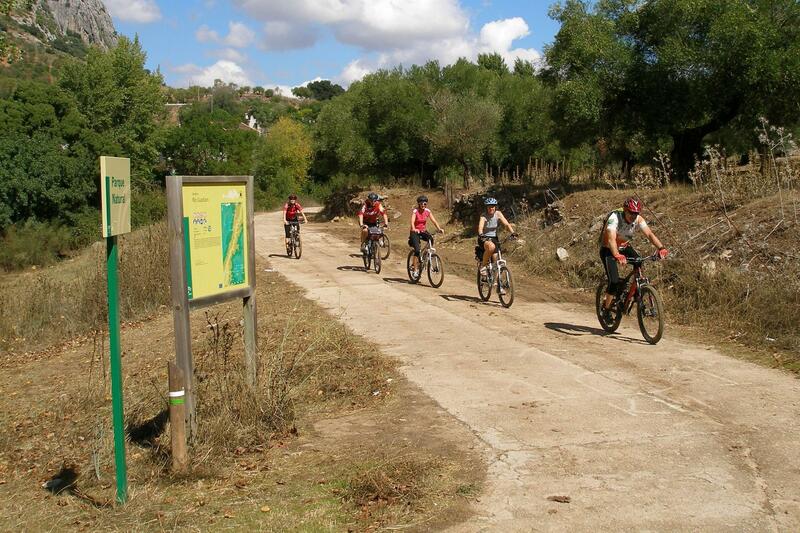 A bicycle vacation that is meant specifically for bikers and those who love history, the bike tour follows the Route of the Almoravides and Almohades -- a major European cultural route. 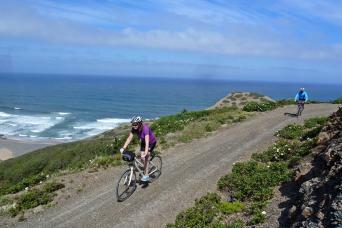 Visit in the spring or the fall for a warm, picturesque, and unforgettable bicycle tour with Pure Adventures. Arrival in Ronda on your own. Depending on your arrival time you can visit the bullring (Spain’s oldest) with its small but very interesting bullfighting museum. There are spectacular views as you cross the bridge over Ronda’s famous gorge to take a stroll round Ronda’s old quarter. You can head down to the river to visit the 13th Century Arab Baths, some of the best conserved in Spain and Europe. Private orientation today possible at 6:00pm, or tomorrow morning with bike delivery at 10:00am. To get to Ronda, there are 2 daily trains from Madrid (4 hours train ride) and serveral busses from Málaga. Our local contact will meet you at 10:00am at the hotel for bike set up, and orientation if not already done. 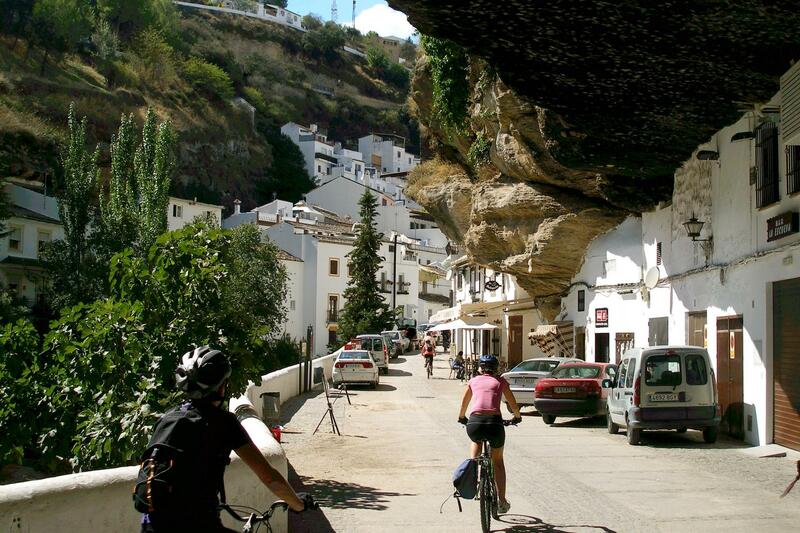 To try out the bikes, enjoy Ronda’s beautiful surrounding on a short loop the small village of Benaoján. You will arrive to the Cueva de Gato, a beautiful spot to have a picnic, and continue to the train station of Benaoján where you can take a drink in the bar ‘STOP’ before taking the train back to Ronda. You can also cycle back of course to Ronda, making the total route 35 km long with quite some uphill coming back to Ronda. You leave Ronda heading north towards Setenil de las Bodegas, one of Andalusia’s most surprising villages, a focal point of the Cadiz mountains white villages’ route. The people here used of the gorge to build their houses. It is one of the finest examples of this type of architecture, which instead of excavating into the rock simply makes use of natural overhang, with the houses developed laterally along the rock face. 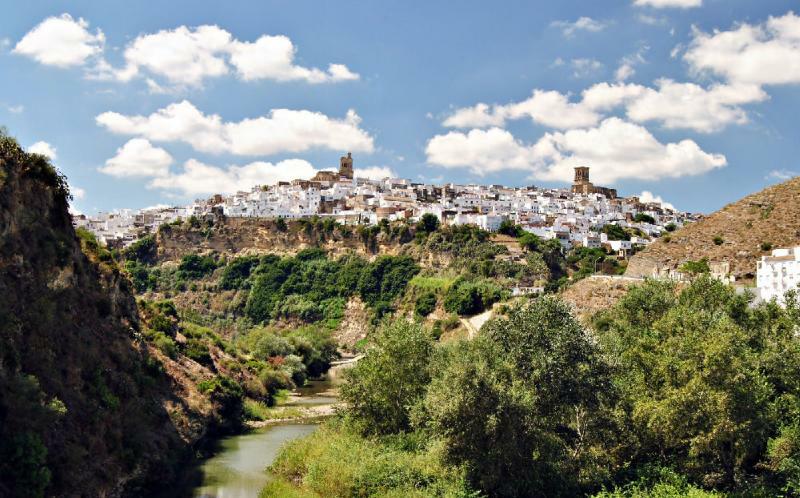 Lose yourself in the village’s intimate corners and tapas bars… You then follow the Trejo River and soon see the village of Olvera in the distance, with its typical church and the 12th Century castle atop a hill. Overnight in hotel** with swimming pool. Olvera was originally to have been a stop on the Jerez-Malaga train line, but the line was never completed and the village went back to its business of producing olive oil. 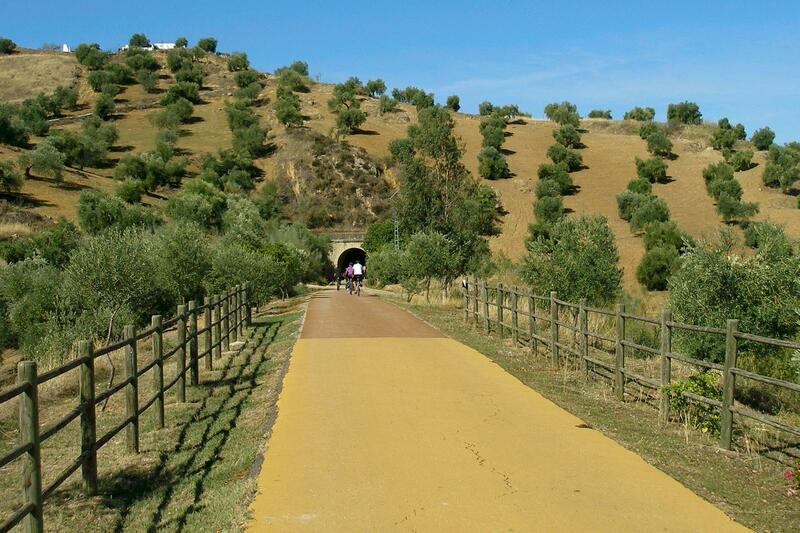 Eventually, new roads removed the need for a railway; now the railway has been given a new lease of life as one of the first Vías Verdes, or greenways (old re-conditioned railway lines), in Spain. 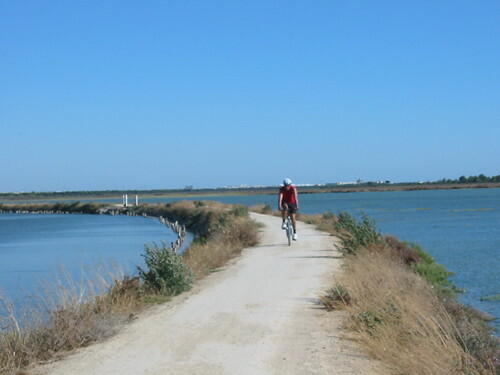 You cycle for 36 km along this greenway (no cars), passing the Peñon de Zaframagón (Nature reserve with Andalusia’s – and one of Europe’s - largest colonies of vultures). You pass through many tunnels (up to 30) – some up to 1 km in length – where lights come on automatically as soon as you enter! You follow the Guadalete River as far as Puerto Serrano, where the greenway finishes and where you sill spend the night in a rural lodging. You can have dinner in the old railway station, now converted into a restaurant. Nestled between the provinces of Cádiz, Seville and Malaga, this rural hotel consists of 8 bungalows, arranged to enjoy a range of activities offered by the natural environment surrounding them with recreational and leisure facilities set itself. The hotel is located next to the old station building "Antigua Estacion Puerto Serrano" right next to the bike path "Via Verde de la Sierra" close to the Northern Sierra of Cadiz and Seville Sierra Sur. After breakfast, follow a narrow country lane, almost a cycle lane, surrounded by gentle rolling hills covered in sunflowers, cotton and vineyards. You will pass the winery Regantío Viejo and continue on the same road to reach the white village of Arcos de la Frontera. Arcos is situated on cliffs high above a meander in the River Guadalete. This is a typical defensive hill village with cobbled-stoned streets leading up to a castle, built in the 15th Century on Moorish foundations. The view from the castle and village is staggering. 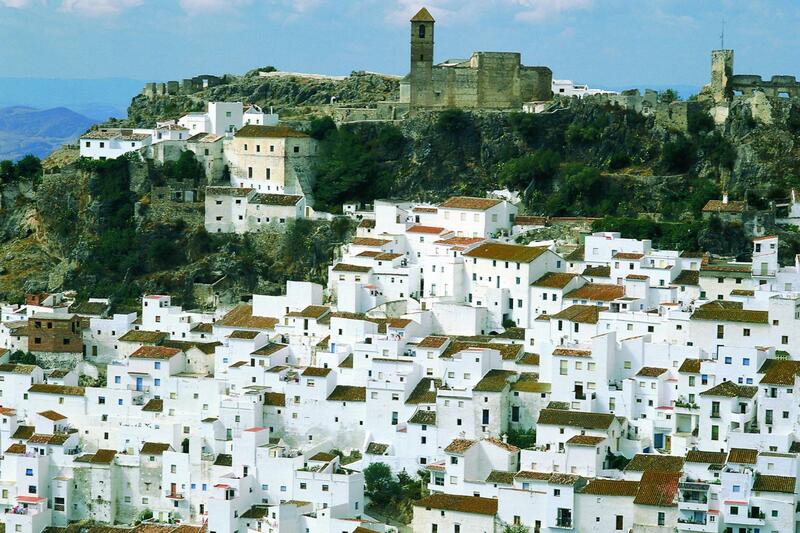 You will stay in a hotel in the historical centre of Arcos. This old mansión in Arcos de la Frontera has preserved the rustic spirit of the palaces from the Cadiz mountain range. In 1729, the Nuñez de Prado family built this "señorial" house that has stood for three centuries. A curious wooden plaque hanging in the Patio tells us about the origins of the house. Today you will leave Arcos de la Frontera and pass through beautiful landscape and see the typical Andalusian agriculture while riding. You will pass the small village of Junta de los Ríos and follow a country road with barely any traffic until you get to the small and lively village of La Barca de la Florida, where you can drink & eat something. For the last 28 kilometers you will follow a road with a bit more traffic, which will lead you directly to your hotel in the center of Jerez, a beautiful town worth a visit. For example, at the Royal Andalusian School of Equestrian Art to see the training of the beautiful Andalusian horses for their “ballet”. Try to arrive in Jerez on Sunday, Tuesday or Thursday so you can see the show the next morning and ask for the thematic visit (8 Euros, booking in advance is needed as it is a popular attraction). There are no visits on Fridays in August and on bank holidays. And of course you can visit one of the many sherry bodegas. Your accommodation is in the historical center of Jerez. You start cycling through the town of Jerez. Then the ride to El Puerto de Santa María is short (around 28 km) but instead of the busy asphalt roads you will go by agricultural paths (so a little bumpy!) to show you where the grapes are growing from which they make the famous brandy and sherry. 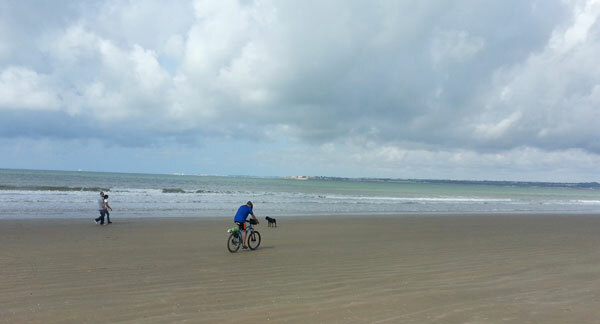 Afterwards, if you feel up to a bit more cycling on flat terrain, you can do the ride through the Bay of Cadiz, passing marshes, salt-flats and Mediterranean pine forests or take the boat to Cadiz to visit this delightful city, which is so different to other Andalusian cities. 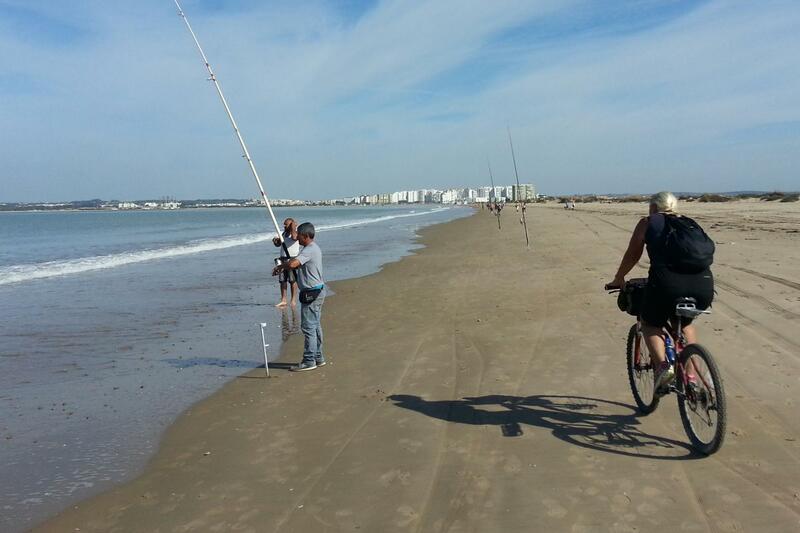 Overnight in a 3 star hotel in centre of the village, very close to the famous fish “market”. Los Cantaros Hotel is located in the historic centre of the city in an area called "Ribera del Marisco", where a wide selection of dining and entertainment venues are to be found. Many of the city's monuments, cultural centres and museums which reflect the important historical-artistic treasures El Puerto de Santa María are also situated within a short distance of the hotel. After breakfast, end of services, unless you have asked for an extra night. Bikes to be left at the hotel with all material. After breakfast in the hotel your trip will be over and by bus or train you can get to Cordoba, Malaga, Seville or Madrid. High season:1-3 November, 5-9 and 20-31 December. Please note that this tour cannot start between 12-22 April; May 1-5 and 11-18, July 1-Sept 3. NO Saturday starts except with 1 night deleted from Ronda. For solo travelers, the supplement is 595 euros on top of the double occupancy rate above. - Self guided cycling can be done all year long; with a few blackout dates. Not recommended in July-August; best times are March-June and September-November. - Best months to travel are March-June and September to November. Duration: 8 days & 7 nights. This is self-guided touring Mountain bikes only are used on this tour because of the terrain that is smooth and groomed paths but often not paved on the last few days near the coast. These can be cut and road hybrids made available. Custom guided groups are possible for groups of 6 or more; please inquire. Level 2+ - Moderate to "fit" rated with Days 2 and 3 being the hardest days with some climbing. Little traffic (except getting in and out of Jerez de la Frontera).. Some unpaved sections are gravel and rocky. This is a self guided tour - see what all that includes! Best Time To Go: April - June, September - October. Our local expert Sandra left the Netherlands and came to Andalusia in 2000 because she loves the region, its people and its gastronomy. 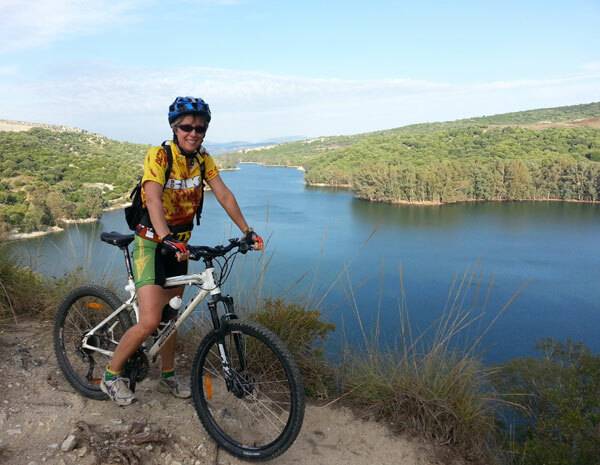 Originally trained as a psychologist, she has been working as a hiking and biking guide for about 20 years, giving her the experience and professionalism we want for our clients. She knows Andalusia better than many locals and can you give you all the support you might need! "We all enjoyed our trip and are now getting over the jet lag. 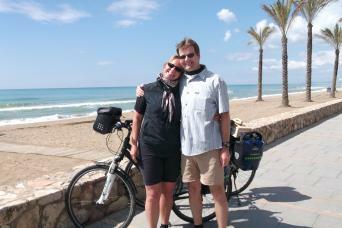 We spent a week after the bike tour visiting Pamplona, Bilbao & Madrid. We will contact you again when our next trip to Europe comes up (probably 2016). Everything worked out well & Bo was a great help." - Steve V.
Mountain bikes are the best available equipment for this routing. This is not a mountain bike tour however, these routes are unpaved and gravel at times and so these bikes are the best for the terrain. Note, by cutting the last day or 2 then all unpaved routes are cut; and hybrid road bikes are possible. E-Bikes are now available! Contact us for details; rate is 350 euros. Pedals: flat or with cages. Travelers may bring their own clipless pedals to have installed. If you plan on bringing your own pedals, please make sure you bring your tools to remove the pedals at the end of the tour since we will not see you.